Root canal therapy or endodontic therapy is a sequence of treatment for the pulp of a tooth which results in the elimination of infection and the protection of the decontaminated tooth from future microbial invasion. 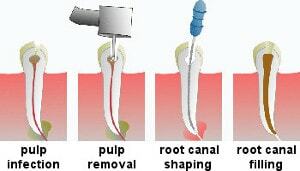 The complete removal of dental pulp tissue from the pulp chamber and all root canals. The subsequent shaping, cleaning, and decontamination of the hollows with small files and irrigating solutions. Specific medication can be placed inside the root canals for several weeks. This is an optional step which becomes important especially when pulp infection is severe. In the final step, the decontaminated root canals are sealed with an inert root-filling material such as gutta-percha and a specific root filling material. When is root canal therapy indicated ? Root canal therapy is indicated when the dental pulp is infected or when a future infection is considered likely or inevitable. In these cases, root canal therapy is required to cure the infection, save the tooth and prevent further inflammation and/or infection of the periapical tissue located underneath the tooth. Basically, root canal therapy is indicated in case of irreversible pulpitis and its complications : apical periodontitis. If extensive loss of tooth structure occurs or the infection is very advanced, extraction may be the only treatment option. In case of a chronic periapical infection (such as a dental cyst or an apical granuloma), an apical resection (or apicoectomy) may be another therapeutic option. 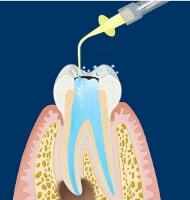 Root canal therapy can be performed under local anesthesia. The dentist may separate the decayed tooth from the other teeth with a small sheet of rubber on a metal frame (called the rubber dam). This keeps the tooth dry and allows the inside of the tooth and root canals to be treated in a clean and controlled environment. 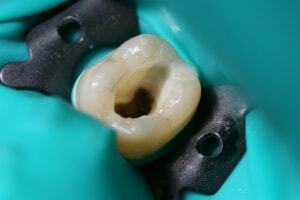 An opening is made through the top of the tooth so that the inside of the tooth can be easily reached. The diseased pulp and all the infected dental tissues are removed with a rounded drill at low speed or with a hand instrument. One of the most common reasons for root canal therapy failure is when the dentist does not find, clean and fill all of the root canals within a tooth. The number of root canals can greatly vary from individual to individual. Normally, molars have 3 root canals (but quite often the first upper molar has four canals instead of just three), premolars have 1 or 2 root canals and the rest of the teeth a single root canal. Some teeth (for example, lower molars) can have more than one root canal per root. The X-ray performed prior to the root canal treatment provides useful information about the number and shape of root canals. 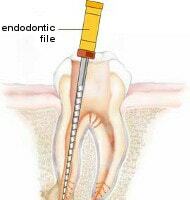 Root canals are shaped with a series of files of increasing diameter. Starting with a smaller file size (sometimes termed a "pathfinder"), progressively larger files are used to widen the canals. This process serves to remove debris and infected tissue and facilitates greater penetration of an irrigating solution used to decontaminate the root canals. Sometimes, canals may be unusually shaped, making them difficult to clean and fill completely; thus, some infected material may remain in the canal. When all root canals are cleaned and decontaminated, the canals can be dried and medicament placed in them for one or two appointments. This is a good option particularly when infection has spread in the surrounding tissues. An example of a root canal medication is the calcium hydroxide paste, a strong alkaline base which is left in for a week or more to disinfect and reduce inflammation in surrounding tissues. 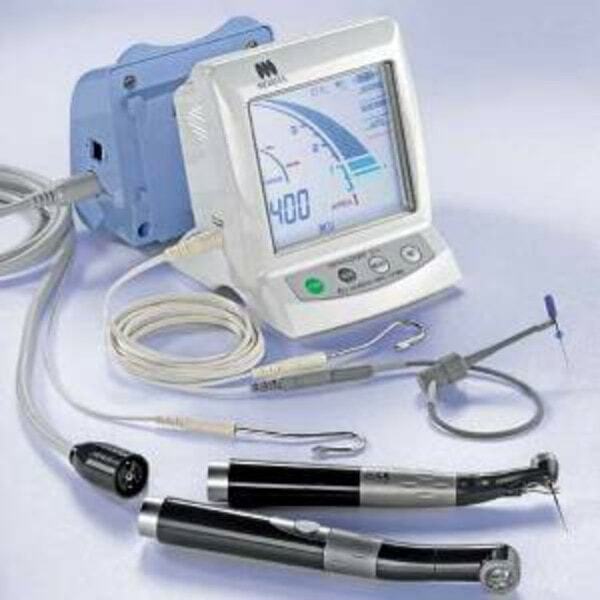 Various electronic endodontic systems are available to help the dentist. These systems have the advantage of monitoring the root canal before, during and after instrumentation, hence greatly increasing the accuracy and safety. The root canals are measured using the electronic apex locator. The apex locator is an electronic device used to determine the position of the apical foramen and thus determine the length of the root canal space. The position of the files and information about the length and shape of root canals appear on a screen that is attached to the device. The final step of every root canal therapy is root canal filling, which permanently seals the root canals with an inert filling material.